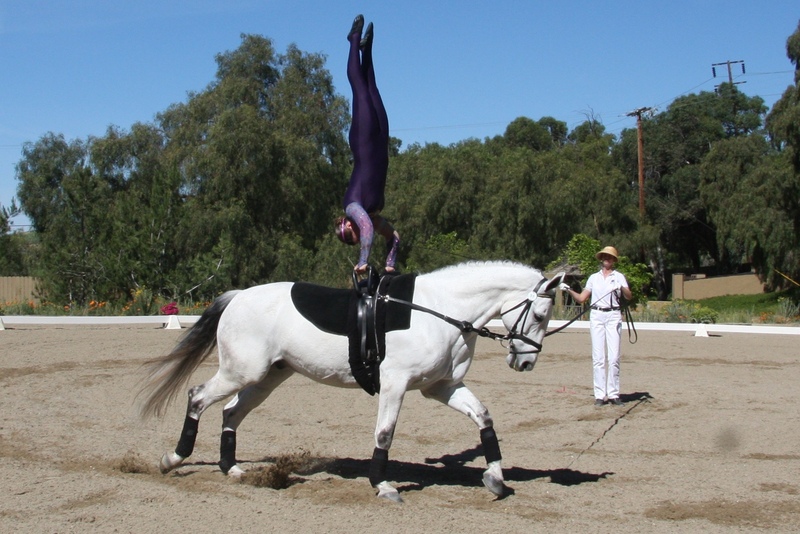 Core strength is the buzz in all sporting activites and very much so in horse riding. But what is it and what does it mean to the horse? A good friend of mine recently invited me to join a 30 day Abdominal Challenge! She is a horse owner and rider and knows the benefits of rider fitness, so a very admirable quest indeed to dedicate a month to strengthening her core. I’m going to give it a go too. I’d rather term it as core stability for the purposes of equestrian pursuits. Here is an analogy. Let’s say you want to learn to ride a unicycle. Pause for a minute and picture the challenge. A vertically balanced bipod (human) learns how to stay upright and stable on a vertically balanced one-wheeled cycle! Now that is some challenge. I expect I would fall of quite a few times, and once I had mastered it, I wouldn’t be able to relax for a second, or I would risk falling again. Then imagine travelling forwards and backwards on the unicycle….how much extra balance and stability would it take? In reality, you are aiming to keep your centre of mass over the unicycle’s centre of mass. Now let’s look at riding. A vertically balanced bipod attempts to sit on a horizontally balanced quadraped (horse). The horse doesn’t speak human, and can change speed and direction at any time, often in an unpredictable way! Mmmm, not such a relaxing sport after all! The horse has a centre of mass, just like the unicycle, It’s just not as obvious. The strength in our core muscles is the means by which we are able to stabilise ourselves whilst on board a moving object, whether it is a unicycle or a horse. 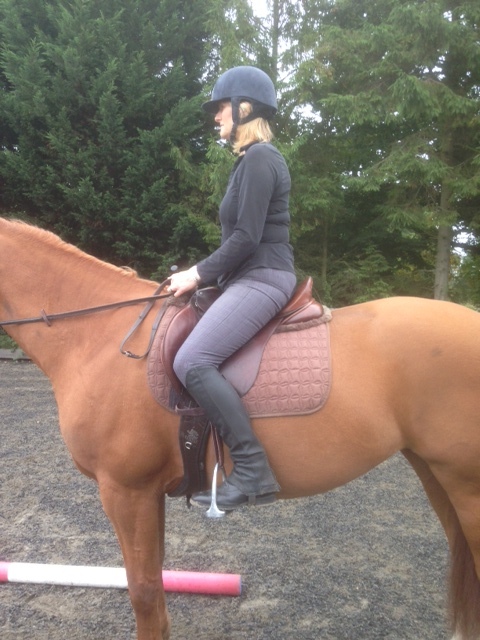 Not only do we need to be able to sit upright in a neutral spine which presents a level of challenge in itself, but as the horse moves forwards, backwards and sideways, we need to do something to stabilise ourselves against the forces that are exerted by those movements, in order to remain upright and stable and not get ‘left behind’. If you were on a unicycle, or ski’s or skates, would you decide to lean back or slump for a few minutes and take a break? No way, because you would immediately fall! And yet we often do this when we are riding. In riding, the horse is like a table. He has four legs, and generally we sit in a cup shaped saddle with reins and stirrups to give security to our extremities! This can lead us to believe we are balanced when in fact most riders are not. 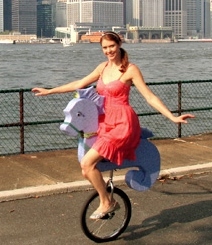 The same level of core stability and balance that is required for the unicycle, is also required for riding a horse, except unlike the unicycle, the horse often ends up absorbing the effects of our poor stability. Think of this equation: on his own in the field, he has 100% of his resources available to balance himself. Take him out of the field and add a saddle and bridle, and he loses at least 5% of his resources. Add an extremely well balanced and fit rider, and he will probably lose another 10 to 25% of his resources. Add a less experienced rider (most of us!) and he is likely to lose up to 50% or more of his ability to balance himself. The more the rider wiggles and jiggles and gets left behind or slumps, the more the horse has to continually adjust his own balance to accommodate this. He can’t speak, so unless we are very tuned in to good balance, it’s easy to miss poor balance, and just assume the horse is being lazy or difficult. 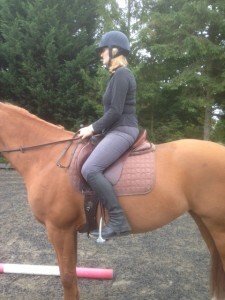 A great deal of training issues can be vastly improved by appraising rider balance. So what is core stability and what does it mean to the horse? It is developing and strengthening your core muscles enough to use them the entire time you are riding. It is learning how to engage them correctly to match the forces exerted on your body when moving at speed so that you stay still whist on board a moving object. It is refining your balance so that you can keep your centre of mass over the horse’s centre of mass, and even help the horse adjust his centre of mass when he needs to. And ultimately it is crucial for your horse’s mental and physical welfare that you take responsibility for your fitness and balance when you ride him. To appraise your balance get someone to take a picture of you on your horse. to land on your feet and stay upright. Then, look where most of your weight is. Is it evenly distributed over the horses back and ribcage, or are you sitting heavily in one spot, or popped up and forward? In part 2 of this blog, I will talk more about the core muscles and how to use them. In the meantime, why not try that 30 day abdominal challenge? This entry was posted in Biomechanics and tagged horse riding balance, horse riding core stability, Horse riding core strength. Bookmark the permalink. Very well put, short and to the point. Oh, so very helpful, thank you!! I’ve been told to use my abs, but no one told me how. I thought they were supposed to be moving, and used as an aid. Now that I realize they are to keep me stable and balanced, I’ll quit trying to “use” them and try harder to engage them for stability. Thank you!! Thanks Laura. In the next blog I will go into a bit more detail about how to engage them, but if in doubt, always ask your instructor or coach for a more in depth description of what they really mean.